9 feet high by 30 feet wide the Xanita board wave was the focal attraction of the room. Finished with Woodside’s original hand painted print on the front face and a matte black finish on the back. 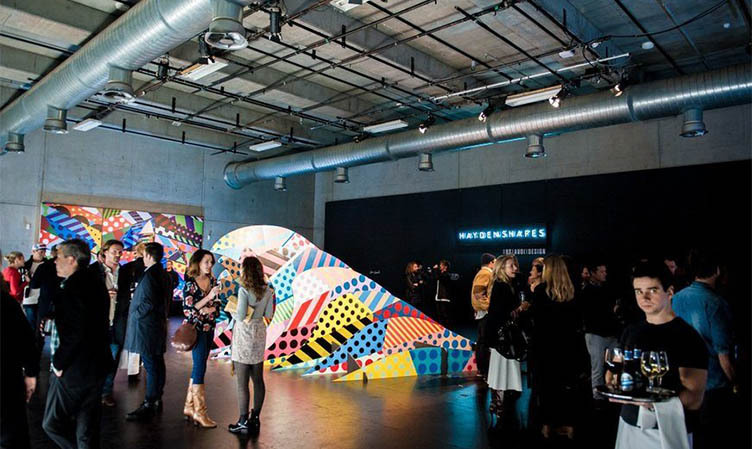 The Gallery event marked the release of a new artist collaboration between Haydenshapes and Woodside whose bright and colorful signature print was added to Haydenshapes latest model release ”Love Buzz” and displayed in the room along with 3 marble prints from Haydenshapes previous Summer Cage Installation project. 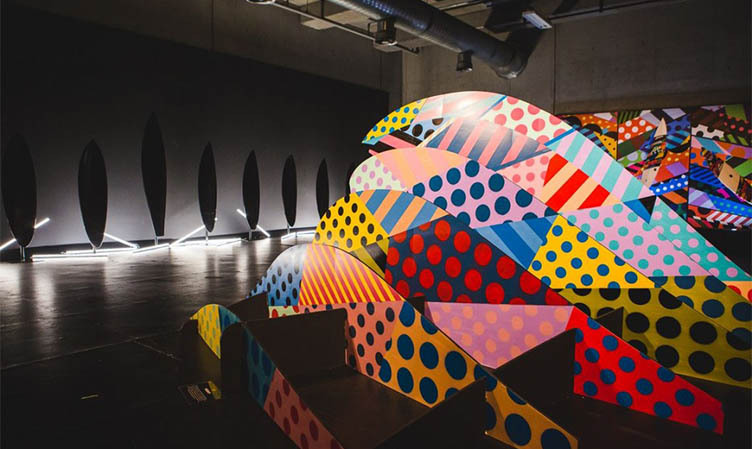 Curated by Hayden Cox, Haydenshapes launched with Semi-Permanent 2015 a dedicated space at Carriageworks in Bay 19 -presented by Audi Australia. 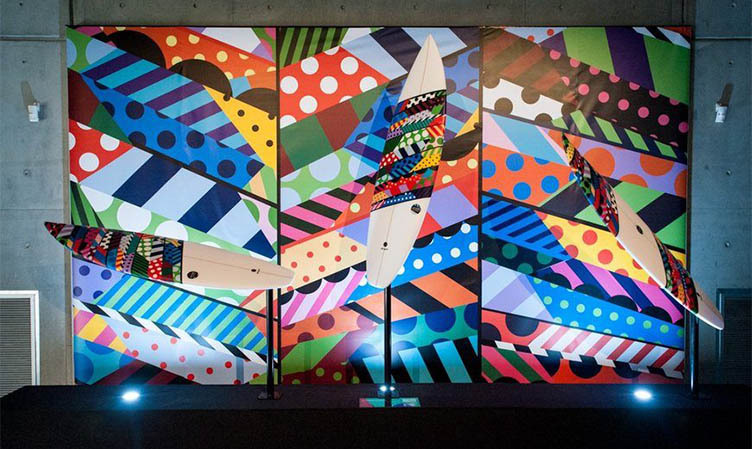 Live for 3 days only, the installation kicked off with guests from the Australian surf industry, fashion and lifestyle media invited along for an exclusive launch event (with special thanks to Stab) hosted by Hayden Cox, Craig Anderson and New York Artist Jason Woodside. The Gallery event marked the release of a new artist collaboration between Haydenshapes and Woodside (Adidas, Colette Paris, Obey) who’s bright and colourful signature print was been added to Haydenshapes latest model release “Love Buzz” and displayed in the room alongside 3 marble prints from Haydenshapes previous Summer Cage marble project. The standout feature of the space however, was the large-scale wave installation designed/constructed by Hayden and built from eco-friendly sustainable Xanita board. 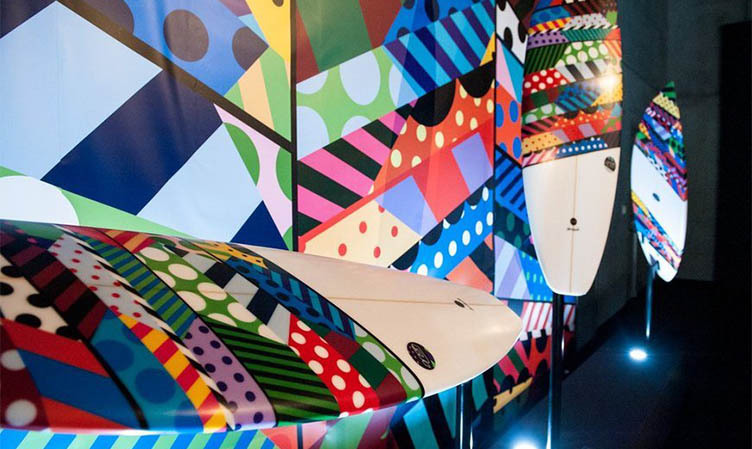 The 9 feet high by 30 feet wide wave was the focal attraction of the room, finished with Woodside’s original hand painted print on the front face and a matte black finish on the back. Following the launch event, Hayden Cox, Jason Woodside and Craig Anderson (the Haydenshapes panel) took to the stage together to speak in the main auditorium to a crowd of 1500 attendees at the Semi Permanent event about their individual views on creative, building global brands and design influences. 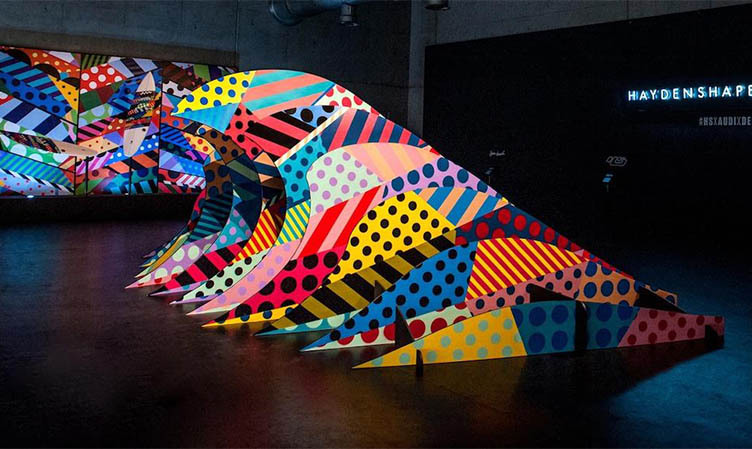 The idea was to create different colour perspectives from each end of the room. As you entered, the aesthetic of the space was predominantly the Woodside print made up of bright pop colour contrasts. 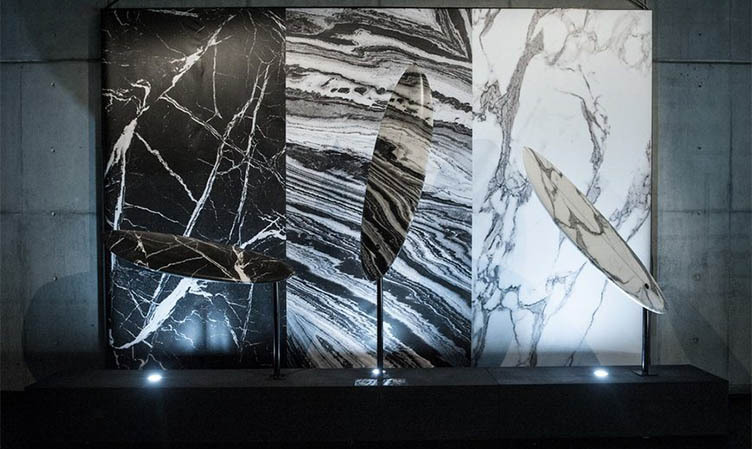 On the opposite end of the room as you exit, the wave in the center switched to black, highlighting the marble prints and transforming the space to black, white and grey tones.